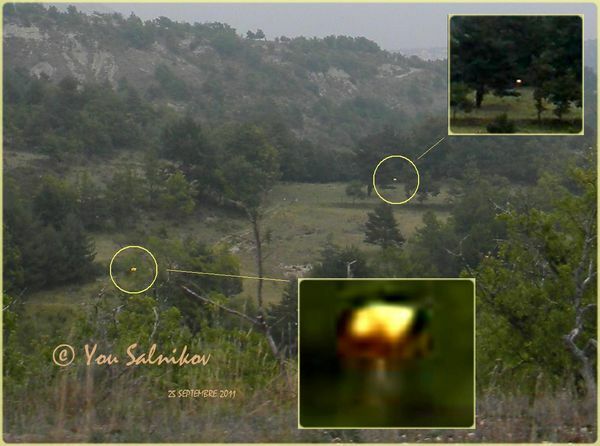 You Salnikov took these pictures of UFOs in Coursegoules at Col de Vence in France September 25, 2011. Thank You Grand Salnikov for its information and beautiful photo, and our friend Thierry de Toulon, which has given us all this and writing the text below, and by presenting us with the photo. The photo above .... : The Col de Vence in the north of the city of Nice on the Cote d'Azur in France is famous for its many UFOs that are photographed in a mysterious way, photos called "Photo Surprise": UFOs are invisible to the naked eye, but appear in the pictures! As if these UFOs use an energy that makes invisible to humans (another dimension? ), But are captured by our optical instruments such as cameras, camcorders. 2 UFO Probes The Col De Vence! Let me introduce You Salnikov, I think this picture will interest you. I took this picture September 25, 2011 at 14:32 in Coursegoules (5kms of the Col de Vence) on the road to the Ourmeau, direction south, perpendicular to the road, the weather was cloudy and windy. He had just made a big storm with rain. I took several photos before and after this shot, it confirms that these objects are passed very quickly, certainly at high speed. At first glance they are 50 cm in diameter, they look solid, yellow (may be an acknowledgment or sign them), the second is too far, but I can see on the first well under a kind of propulsion or some kind of fluid generated. I think of two exploration probes. I'd be very interested to join a group or a teammate to make a few trips. In my article "The Intelligences of the Underworld alongside us," I recall particularly the case of the UFO Contacted Ms. Lansing United States: film reels in his 60s, appeared in UFOs and aliens!